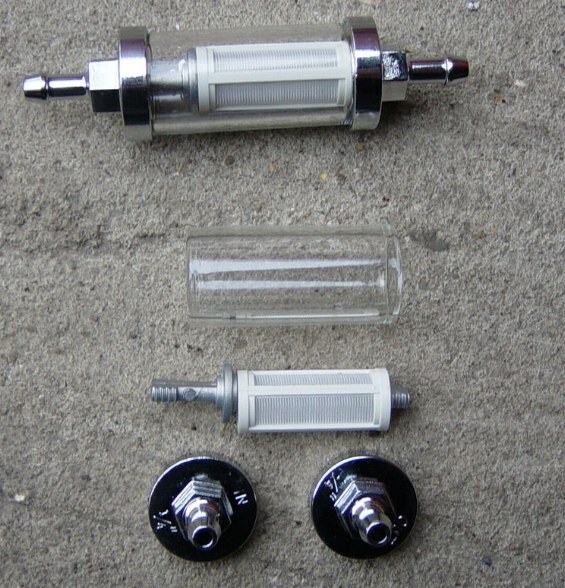 We can also supply another style of reuseable filter. This type is housed in an anodised red alloy case, however as it does not come with a range of pipe adapters it is only suitable for cars with a 1/4" fuel line (eg Triumph, MG, Mini, Jaguar and other British classics). Bizarrely, we've sold quite a few of these filters to people who want to use them to filter Biodiesel and vegetable oil which they have been using as fuel for their diesel cars.(!!??) Apparently normal diesel car filters get clogged quickly with these fuels and this filter can be quickly & easily cleaned and reused. Never tried it myself so can't recommend it personally. See here for more info about biodiesel.